I just downloaded openMSX 0.13.0 because I wanted to follow the tutorials on the site of Javier Lavandeira. But I'm already stuck from the very beginning. 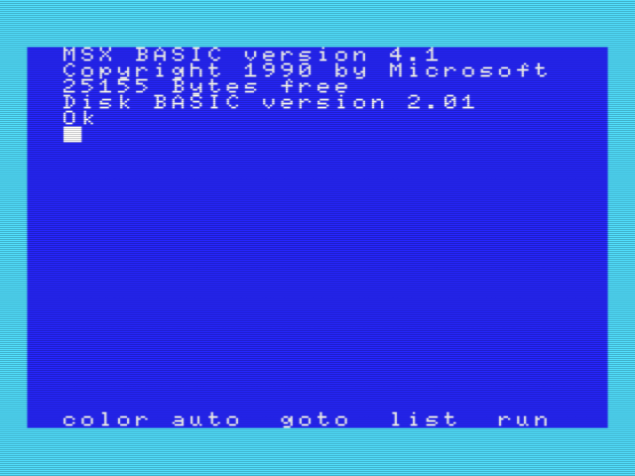 The problem occurs when I follow along with 'Relearning MSX #5: Setting up the MSX-C environment (part 1)'. and put them in the systemroms folder of openMSX. You mean it is stuck in that screen? It should go to BASIC right after that. I just tested it, for me it also freezes. I have never used this before. Is it because I dont have a real cd rom? Or do I need to format /initialize the default hdd? Can you tell me where I can find the console option in openMSX? Thank you, everything is fine now! I have the same problem that you had, but when I try to introduce the command diskmanipulator create MSXC12HD.dsk 32m 32m 32m 32m appears the message Couldn't create image: Error opening file "MSXC12HD.dsk": Permission denied. While I was following your advise I realized that I have to run Openmsx as an administrator in windows!!!!! No, you should not run openMSX as administrator on Windows. Unless strictly necessary you should never run any programs as administrator. The problem is simply that the current working directory is in the path of openMSX or Catapult.